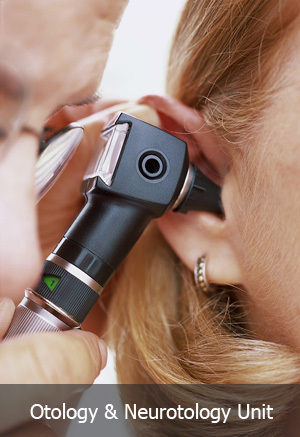 The Otology division is concerned with medical and surgical treatment of a variety of ear diseases including middle ear effusions , inflammations and tumors, cholesteatoma, Meniere's disease, facial nerve paralysis, otosclerosis, hearing loss, congenital malformations of the middle and external ears, Surgical procedures include state-of-the art microsurgical techniques and reconstructive and prosthetic tools, in a wide array of surgical operations such as : tympanoplasty, myringoplasty, mastoidectomy stapedectomy, facial nerve decompression and grafting, reconstructive procedures for external canal atresia and congenital deafness and many operations for diziness and Meniere's disease. Our neurotolgy team in cooperation with our neurosurgical associates performs many advanced neurotologic and skull-base surgical procedures for the treatment of various cerebello-pontine angle tumors in addition to various pathologies of the middle and posterior skul base such as acoustic neuromas, meningiomas, glomus tumors, congenital cholesteatoma and fracturs of skull base. Our cochlear implant team works in full cooperation and organization with the audiology and speech pathology divisions in a pioneering project serving the whole of Northern Egypt.